Finally, after a lengthy break to deal with my Finals my regular column can get back to normal, and for my return to the realm of menswear I thought that it would be nice to address a reader’s question. 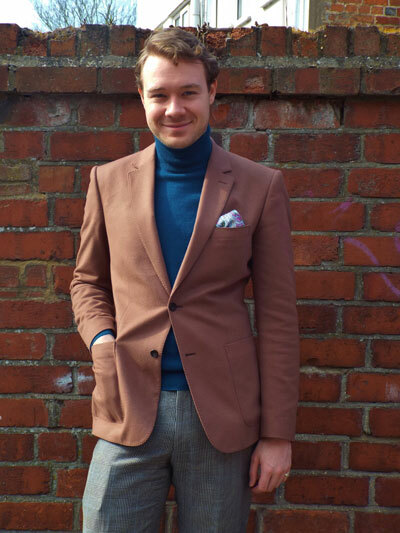 I was asked recently on my own blog what my recommendations would be for the individual looking to either develop or reconstruct their wardrobe around a number of well-constructed, good quality classic tailored staples. Beneath are my recommendations for just those items. A dark blue suit will go anywhere and do anything. Aim to find or commission a suit in a mid-weight cloth (I find that ten to eleven ounces works well – possibly twelve) which feels comfortable and reasonably light when worn. Possibly get it half-lined to help keep it airy when worn. This will maximise its use through autumn, winter and into spring and stop you overheating. Mid to light-weight suits are also a blessing on public transport in the warmer months when it starts to get a bit humid. I’ve lost count of the amount of times I’ve optimistically suffered in full-bodied 14oz jackets on the Tube. A subtle check or stripe may enhance the suit’s interest, but I’d recommend keeping any patterns minimal. If you’re looking to invest in just a couple of staple suits, rather than suits which serve specific functions don’t blow your budget on a garment which is too dressy, nor too business-like. In other words, use your discretion and stay away from turn-back cuffs, shawl collars, shiny cloths and statement chalk-stripes or windowpane checks. I would recommend adding a waistcoat though if possible, and potentially trying to find something with peaked lapels. The waistcoat can add another dimension cheaply for formal occasions, and a peaked lapel is the perfect way to add some elegance to your business two-piece, without being inappropriately showy at the office. With this staple in your wardrobe, many individuals would recommend a charcoal or plain grey flannel suit be your next addition. Whilst I quite agree with this, I would also like to make a case that once your blue suit is sorted, there is potential to choose either a grey suit, or indeed a chocolate suit. I have written at length before of the suitability of chocolate as a staple colour for men’s tailoring; its elegant, rich and makes for a very useful addition. As colours palettes go its slightly more distinctive than the usual charcoal, whilst also being completely conventional and versatile in its use. I would likewise advise you compliment your suiting with the addition of a couple of pairs of good light and mid-grey flannel trousers, to use as tailored separates. Trousers are perhaps the most accessible way to really expand one’s tailored wardrobe and to add some real style to an outfit with a distinguished cut (see my series on getting trousers right from earlier this year). Grey flannels will go beautifully with your navy suit jacket, should you choose to use it as a blazer, but they’ll also look great with mid-brown brogues or Oxfords (which I’d suggest be your staple shoe of choice – they will go with more than black believe me; any shade of grey, blue or brown is covered) and a lovely knitted jumper of polo neck for the weekends. Once your wardrobe becomes a little more established, you can play about with different colours (cream flannels are another classic that can work really well with fun coloured knitwear), and a classic mid-weight Prince of Wales check trouser also looks great with either charcoals or navies – or even brown tones, as can be seen here. Shirting wise, if you’re wearing good tailoring, or even a nice jumper and jeans on the weekends, good quality shirts are really not difficult to find and make a huge difference. Hawes & Curtis and Charles Tyrwhitt offer really excellent, elegant British shirts with a mixture of modern and classic patterns. I’d aim to invest in double-cuffs for business dress and formal wear, and four to five good classic shirts during the sales for the weekends. For both business and pleasure, classic British colours and stripes are timeless and elegant, and will help to create a capsule wardrobe. Bengal and block stripes, poplins and herringbones should be the order of the day in sky blues, navy and white stripes, pale pinks, lilacs (possibly purple) and I’d also look for a couple of top-quality white shirts in plain poplins. A crisp white shirt looks a treat both with jeans or a full three piece and a plain poplin cloth is light and airy and just as wearable in the heat of summer as it is under a blazer or suit in mid-winter. Essentially, the message with all of these things is to build up your collection of clothes gradually and give some thought to which staple options are going to make for wise investments and will go with the majority of things in your existing wardrobe. Most importantly of all, keep everything understated and classic until you can afford to splash out on some more eccentric statement pieces. Get the foundations of your wardrobe laid first; two timeless suits, some flannel separates, a good pair of brown shoes, some simple silk ties and some crisp white shirts. As always, I would recommend following the mantra of really taking the time to shop thoroughly, cleverly and to just buy the best that you can afford when investing in staples. For many people it is simply not possible to spend large amounts on high-end or bespoke suits – but there are a lot of handsome reasonably priced pieces out there by brands like Hackett and Jaeger which can be great investments. Try to challenge the typical male mentality of disliking shopping, because taking a day to hunt up and down your local high-street or shopping district and doing your research is the way to find those pieces which will serve you the most, for the best price. Being patient and striking on the first few days of the sale season often holds real rewards too, as does shopping in outlet stores. 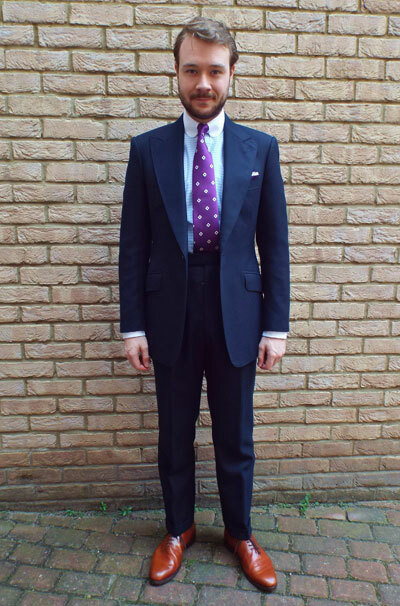 I found a number of Hackett and Gieves & Hawkes suits for around £400.00 in an outlet centre just the other day and £400.00 is about the cheapest you’ll find for a truly good suit nowadays. Equally, if full-bespoke is not an option, made-to-measure services can be an excellent solution and some firms are offering very reasonably priced services at the moment. Take a look at Cad & the Dandy’s machine made offering, or Ede & Ravenscroft’s personal tailoring service for possibilities. Also see Mr. Chesterfield’s column for a number of recommendations for good made-to-measure options. Having interesting pleated or high-waisted trousers with turn-ups and interesting pocket designs made to measure can cost less than fully priced off the peg trousers, and can lift the quality of your wardrobe magnificently. Next week, I’m going to continue with this theme, but turn my attention to creating a spring/summer capsule wardrobe on a budget, this is something that has been vexing me recently, so it should make for an interesting discussion. That’s a great start. I might save up and add a pair of flannel trousers to my cad and dandy order next month. I’ve been on the lookout for a pair in the shops for a while but havnt found anything that fits the bill. The spring summer question is defiantly an interesting one! Look forward to reading that soon! 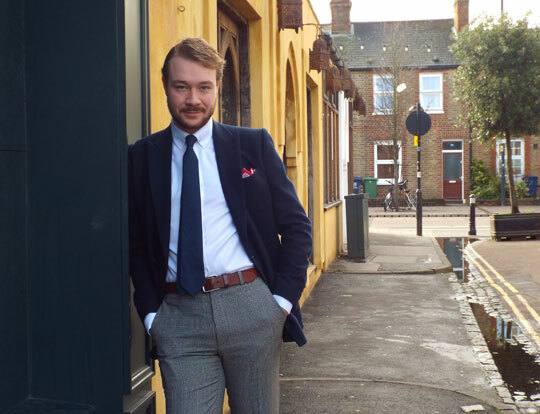 Glad to have been of service – and I’d definitely recommend spending that little bit extra for a pair of classic grey flannels – the trousers at C&D are very reasonable – you can get a good solid pair made for £190.00. Just a note to say how much I enjoy the site and I am particularly looking forward to further posts in this thread. 50+, ex-guardsman but always willing to learn in the sartorial stakes. Many thanks for your compliments – its always a pleasure to hear that readers are enjoying the column. The next piece will be available soon. Jolly smart on the whole – though a tucked in tie is just absurd. Surely a tie should hang just above the waistline? Glad you like it all. A shame you’re not a fan of the tucked-in tie though – I rather like it. Its not possible to get a tie to hang just above the waistline when the trousers sit on the waist – the tie is simply too long. It was common to tuck ties in during the 20s and 30s for this reason, and given that I tend to wear 30s inspired tailoring with high-rise trousers, I too have to tuck my ties in sometimes.